The extraction economics of fossil fuels. 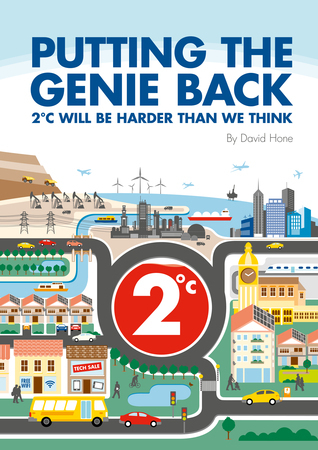 But few of us have the time to really think about an issue such as climate change, let alone read books on the subject or attend seminars, lectures and climate conferences (although quite a few of these don’t mention CCS at all and some barely acknowledge the need for a carbon price). Rather, in this word of social media, 140 character tweets and 24/7 News Channels, we often get just a few minutes to come to terms with a concept and form an opinion. As such, is it possible to explain the role of CCS in such a short amount of time? With an eye on the UN Climate Summit and then the opportunities in the lead-up to COP21 in Paris, the World Business Council for Sustainable Development (WBCSD) has given it a try. The media they have used is video, working with an exciting graphics company called Carbon Visuals. The challenge was to help the audience understand why CCS is important in just a few minutes, not just by being told so, but by being convinced. 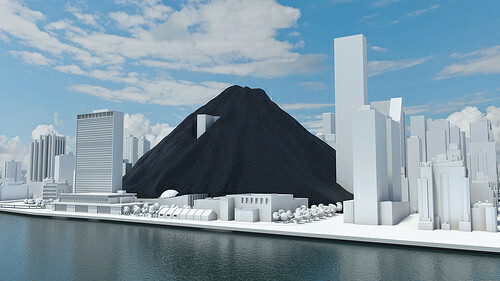 Carbon Visuals focussed on two key aspects of the climate issue, that being the huge scale of fossil fuel use and the way in which CO2 from this use accumulates in the ocean / atmosphere system, with further accumulation likely due to the global fossil resource base still to be extracted to meet energy needs. The visuals depicting scale are very attention grabbing, to help the viewer recognise that fossil fuel use is highly unlikely to diminish in the near term or even vanish in the longer term. For example, daily global coal use alone buries Midtown East Manhattan. This is then contrasted with renewable energy, which while growing very rapidly, isn’t even outpacing the growth in fossil fuel use, let alone forcing it down. 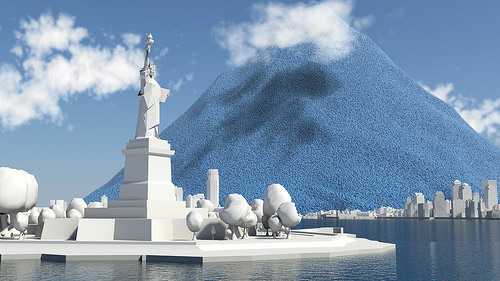 The animation steps up a notch when it comes to depicting CO2, which bursts out of Central Park and literally buries New York as it accumulates. These spheres are something of a Carbon Visuals “trademark”, first appearing in an excellent video they made about New York City emissions. 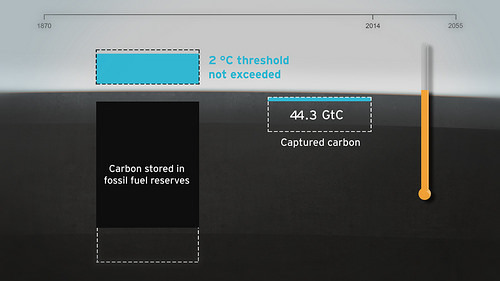 Finally, the animation puts this into perspective in terms of global accumulation and the likelihood of exceeding the trillion tonnes of carbon threshold (and therefore 2°C), unless of course large scale deployment of CCS takes place to mitigate such an outcome. Of course a great deal has to happen for this scale of CCS to be built, starting with more widespread application of carbon pricing. You can watch the animation here and look in more detail at the images and thinking behind it here. I believe the message in the video is misguided, because there is no urgency and it seems to present CCS as a timely and effective solution. What audience member will actually take some decisive action? Perhaps a Carbon Fee & Dividend (CF&D) would be politically palatable for the revenue neutral tax crowd, but my fear is that the people who see this video are not the right audience, nor is the message urgent. Science calls for abandonment of hydrocarbons. CCS only mitigates a fraction of GHG emissions, those from large coal and gas facilities. The fact remains that we would still need to begin producing and burning steadily declining quantities of petroleum and natural gas, even if CCS could be implemented effectively and quickly, which is unlikely. We cannot wait for CCS. We must have alternate parallel efforts that are effective. 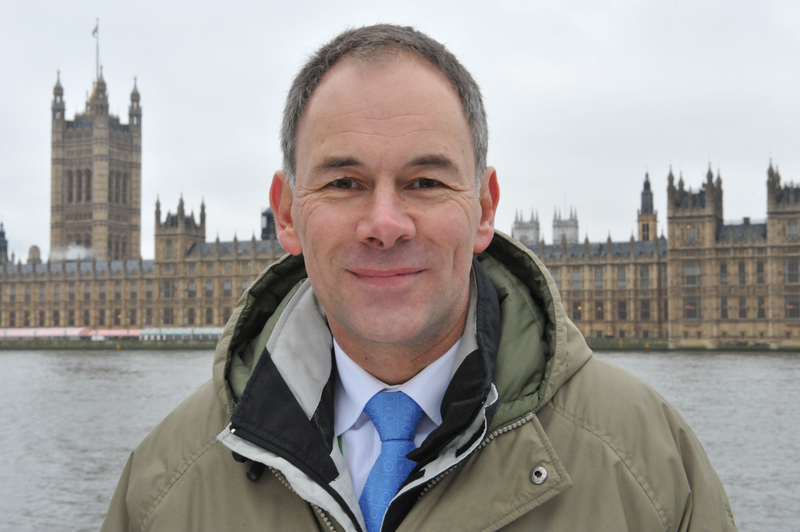 What would effectively reduce CO2 emissions right away? Shut down one refinery, then another and another. Emissions will decline. How long must we wait before refineries are scheduled for retirement globally? Retiring refineries would put a ‘de facto’ price on carbon that is market driven, not a watered down compromise from omniscience omnipotent politicians.